Nikon Corporation (Michio Kariya, President) is pleased to announce that the National Aeronautics and Space Administration (NASA) has placed an order for eleven D3S digital SLR cameras and seven AF-S NIKKOR 14-24mm f/2.8G ED lenses to be used for photographic documentation. The D3S digital SLR cameras and AF-S NIKKOR 14-24mm f/2.8G ED lenses ordered by NASA will be carried on the Space Shuttle and used to photograph activities at the International Space Station (ISS) in the future. No special modifications will be made to these products. They will be the same products available to end-users, confirming the incredible versatility of the D3S. This equipment will be used along with the Nikon D2XS digital SLR cameras, NIKKOR lenses, and Nikon Speedlights already in use at the International Space Station. Nikon has spent many years contributing to NASA's study of space through the development and manufacture of advanced and extremely durable cameras as well as of NIKKOR lenses that make the most of Nikon's optical technologies, and of which production has recently reached fifty million units. To date, NASA has captured more than 700,000 images using Nikon equipment carried into space. Space, however, is not the only extreme environment in which Nikon equipment is used. Nikon also provides official observation equipment used in exploring the Antarctic. Nikon equipment contributes to observation and research of these little explored regions with durability, reliability and technical capabilities that stand up to even the most severe environments. The "Small Camera", based on the Nikon F3 and equipped with a motor drive, and the F3 "Big Camera", which utilized long film, were delivered to NASA. The "Small Camera" was used aboard the Space Shuttle Columbia launched the following year. D2XS digital SLR cameras were delivered to NASA. Six D2XS cameras are used in space to document activities such as inspection and maintenance. In addition, already about 15 types of NIKKOR lenses (more than 35 lenses all together) are kept aboard the International Space Station for intravehicular and extravehicular photography to provide continued support for NASA's space activities. 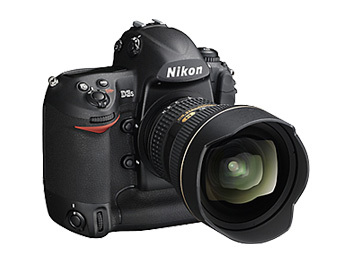 The D3S was released in November 2009 as the latest flagship model for Nikon FX-format digital SLR cameras. This camera is equipped with a new CMOS sensor (36.0 x 23.9 mm) developed by Nikon and supports standard ISO sensitivity settings of 200 to 12800. Sensitivity can also be set as high as Hi 3 (ISO 102400 equivalent) or as low as Lo 1 (ISO 100 equivalent). Image-degrading noise has been minimized to enable shooting at high sensitivities under even extremely dim lighting. In addition, the D3S is equipped with the D-Movie function, enabling HD video capture and includes high-sensitivity movie mode and movie editing functions for trimming start and ending footage or saving selected frames as JPEG stills. Naturally, the camera itself is representative of an all-round flagship model offering basic performance and operation that meet the strict demands (fast, support for high sensitivities, superior image quality) of professional and advanced amateur photographers in a number of fields, including the press, sports and nature photography. 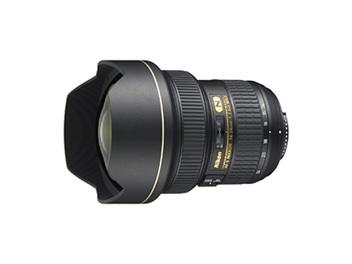 The AF-S NIKKOR 14-24mm f/2.8G ED is the world's first ultra wide-angle, zoom lens to offer a focal length of 14mm with a maximum aperture of f/2.8. The performance of this lens has been extremely well received by the camera industry, and recognized by Europe's Technical Image Press Association (TIPA), which awarded it The Best Professional Lens in Europe 2008, and the European Imaging and Sound Association (EISA), which awarded it European Professional Lens 2008-2009. Specifications and equipment are subject to change without notice or obligation on the part of the manufacturer.